In case you weren’t already aware, K. W. Jeter was the first person to put the word Steampunk into print. You can find out more about that story here. I always enjoy a story with imagination, and Morlock Night certainly fits the bill. Jeter constructs a story that includes Arthurian folklore, Atlantian technology and the time travel paradox that is seen through the eyes of a Victorian gentleman. There was a lot of flag waving for England, but many of Hocker’s biases about class and gender are confronted and changed, which adds the weight of social commentary to a fun story. The combination of disparate elements such as the Morlocks and a submarine stolen from the former residents of Atlantis reminds me of epic tales like Verne’s Mysterious Island, so as long as you go in expecting to suspend your disbelief Morlock Night has a lot to offer. But, a bit of criticism about the ending. I had already guessed the twist so I was gearing up for an epic climax and was disappointed. The final good vs. evil happens in only a few pages. It felt like Jeter was under deadline or something and just had to wrap it up quick. I am reading his other two steampunk books, Infernal Devices and Fiendish Schemes, and I hope they get to come fully to fruition. For a complete list of K.W. Jeter’s works, click here. I’m so glad you like Jeter too! 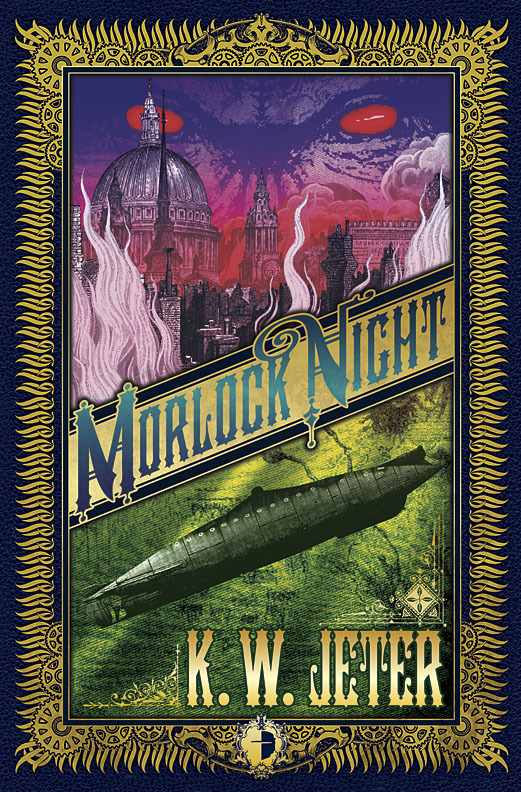 Morlock Night first got me interested in steampunk (although Infernal Devices made me fall in love with the genre: I’ve never laughed so hard as when I first read that! I know Jeter has his critics (many don’t like him mixing in the myth / folklore aspects like merlin and selkies I think…it’s all a bit, as you say, ‘suspending disbelief’ ) and I think you’re right that Jeter wrote both this and Infernal devices on editorial order so he may well have been pressed (although actually the deal fell through I believe and he had to find a different publisher? Or maybe that is urban myth…) Sorry, I don’t mean to take up all your comment space with my rambling, just a very big Jeter fan (and Mark Hodder – a very close second!) The point I make to those who disparage him is that he made the first in-wave, he was the pioneer and that’s a lonely and uncertain place to be: I have to respect what he was trying to do, even if I can see the glaring faults with the finished article. I have been trying to get a hold of Infernal Devices for weeks through the library but so far no luck I have Fiendish Schemes, and it says it is a “stand alone” sequel so I am hoping I can read them out of order and not miss out on much. Great review. Looking forward to your thoughts on Fiendish Schemes and Infernal Devices. And Biahelvetti is so right about Mark Hodder. Loved his first book, Spring Heeled Jack. I read it and reviewed it about a month ago 🙂 I LOVED it!